Here you on this page we’ll discuss TEVTA Punjab Jobs 2018 Application Form for Faculty Positions. 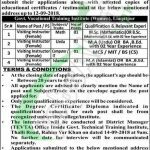 Jobs in TEVTA Technical Education & Vocational Training Authority Government of Punjab are available and it is looking to recruit for Visiting Faculty Staff in Government Vocational Training Institute (Women), Liaqatpur on Urgent Basis and for this purpose, it is seeking for highly educated, very experienced, hardworking and well-disciplined candidates for the following positions such as Faculty Staff (Visiting Instructor (Math), Visiting Instructor (Urdu), Visiting Instructor (Computer/IT), Visiting Instructor (Islamiat)). Appointment of above-mentioned positions will be done on the temporary basis and these positions cannot be permanent or regular. Candidates willing to apply should possess relevant qualification and experience as per the eligibility criteria mentioned in the following image and according to the criteria candidates willing to apply for Faculty Staff should possess MSc/MA/MCS/MIT/BCS/BA/B.Ed with experience in the relevant field is required to apply. Candidates who fulfill the criteria for qualifications and experience are encouraged to apply as per the following how to apply procedure which is given in the very next heading. Applicants should apply on the prescribed form which can be downloaded from the official site of TEVTA or through web link given below. Application Form Can also be obtained from the Government Vocational Training Institute (Women), Liaqatpur. Application forms along with detailed CV, attested copies of educational certificate, experience certificate, CNIC, domicile and recent photographs should reach the following address given below. The last date for submission of application is September 12, 2018. Late submission / incomplete applications shall not be entertained. Interview for Visiting Faculty will be held from 14th September 2018. However, no TA/DA shall be admissible for the interview. Stay in touch with us and keep visiting our site JobsAlert.pk for more jobs.